These porcelain enameled metal trays have a convex center so water runs to the edges, making them the perfect palettes for dry brush techniques in watercolor or gouache. 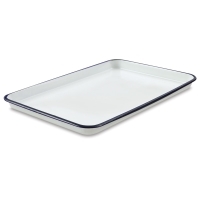 Modeled after the original American butcher trays, the smooth surface cleans easily and can last a lifetime. The inherent small rim chips will not affect performance.